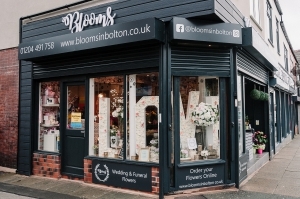 We are a family run florist passionate about creating beautiful bouquets with the freshest of flowers at affordable prices. We can create gorgeous modern displays as well as traditional floral bouquets to suit your style and budget. We deliver to a wide area in Bolton, Horwich, Atherton, Westhoughton, Leigh, to name a few. Here at Blooms we just LOVE flowers and creating something new and different with added touches. The flowers were delivered on time and reported to be excellent. Recipient was delighted. Flowers were just delightful.